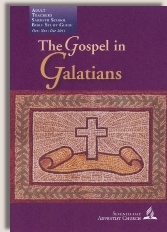 Commentary on "Boasting in the Cross"
As I've read through the quarterly in this study of Galatians I've noticed that it hasn't had the depth that it could have had. The main reason for this is because the writers of the quarterly have taken you all over the Bible selecting a few verses at a time, and peeling those verses out of context to make a point or to bolster a point that has already been solidified within their Adventist belief system. This is the most dangerous kind of teaching imaginable. It also implies that a straightforward reading of the book of Galatians would be incomprehensible. Is such a thing actually a true reality? No. Is it impossible to read the book of Galatians or any other book for that matter without referring to a companion help like EGW Notes? No. Is it possible to read the book of Galatians or any book of the Bible simply by reading the book and asking God the Holy Spirit to lead you to all truth? Absolutely. So this week I'm going to take you carefully through verses 12-18 except when I have to comment on something erroneous with the quarterly that catches my eye. Your quarterly states that boasting on the cross of Christ is the focus of Paul's letter to the Galatians and I agree that our focus should be on the cross of Christ—not a day—like the Sabbath. However the whole impetus of the book of Galatians is not that we should boast in the cross but that mixing law and grace is a lethal cocktail that not only alienates us from Christ, but attempts to add works of the flesh to Jesus' finished redemption. While I wholeheartedly agree that our focus should be on the ENTIRELY FINISHED work of salvation on the cross, too often, especially in Adventism, the focus is off the cross and what Christ did there and back into the Sabbath—which Christ himself fulfilled on the cross. So let's get to it. Time to dig into the book of Galatians. Copyright 2011 BibleStudiesForAdventists.com. All rights reserved. Revised December 21, 2011. This website is published by Life Assurance Ministries, Glendale, Arizona, USA, the publisher of Proclamation! Magazine. Contact email: BibleStudiesForAdventists@gmail.com.